The Bowman Cemetery was started in 1868 when John D. Bowman buried his daughter. The cemetery and park cover 3.6 acres of land. The deed is listed in Vol 3094, p 549. It says this is a masonic cemetery. There are 2 fenced areas in this cemetery. The Bowman section is the one with the tall spires and the wrought-iron fence. The other section is for the Browns and has a wire fence. There are several stones outside the fences. The overall cemetery is not fenced, just the family plots. 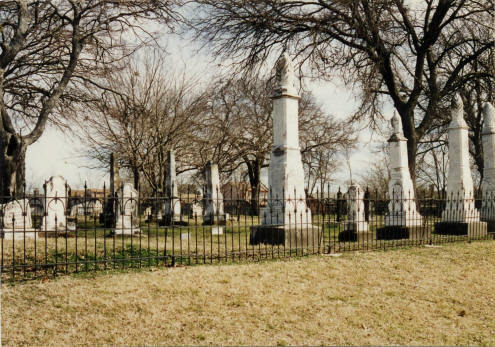 The local Masonic lodge deeded the cemetery to the city of Plano in 1989. The cemetery has a City of Plano Historical Marker. The city of Plano maintains the cemetery and park. The Rand McNally Maps list this as the Oak Cemetery.